The 15 Metre class evolved in three key stages. 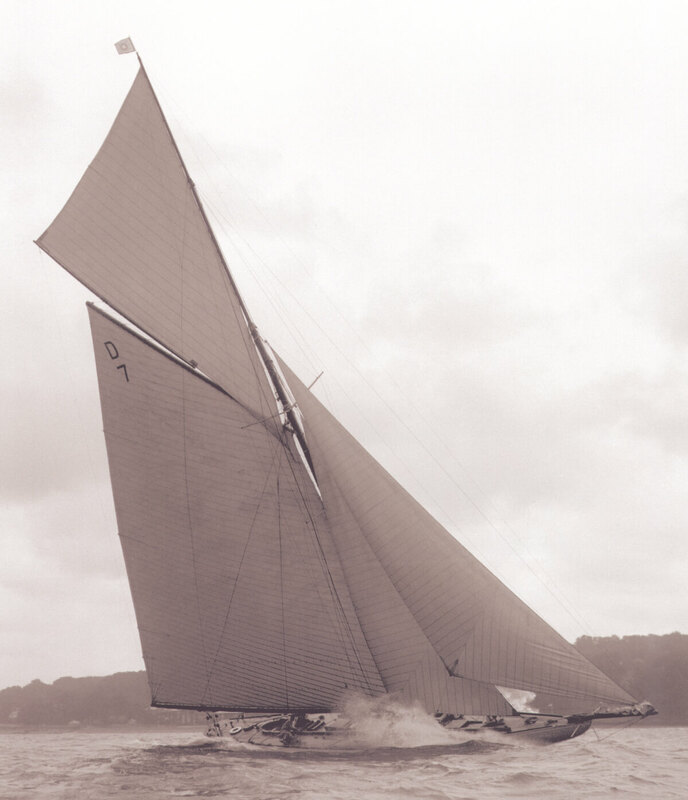 The initial yachts gave way to a second generation with iterative improvements until 1912. Then, Istria was launched and the class, the rule that underpinned it and the evolution of racing yacht rigs was changed for good. At a time where a topsail was laced to a jack-yard and hoisted from the topmast, Charles Nicholson developed the Marconi mast wherein the topmast is extended to the full height of a jack-yard and the leading edge of the topsail is hoisted on a track for its full length. The main advantages of this design lay in improved sail shape and Istria was the first yacht to carry this rig. Istria’s hull shape is characterised by a long forward overhang and a wide beam at the waterline giving both a reduced wetted surface and a very stable platform. Described in Yachting Monthly at the time as; “Short on the waterline, with large displacement, a fine tail and a useful snout, she would not have been a pretty vessel had she not proved clever. But as I have always insisted that efficiency is beauty, the blue ‘fifteen’ was admired”. Istria’s position as the pre-eminent 15 metre in the class’s history remains unchallenged. Nicholson was an extremely able racing helmsman with a good understanding of how to get maximum performance from a racing yacht. He introduced fresh and innovative construction techniques and was very conscious of the impact of wind resistance. To minimise this Nicholson designed the dinghy cockpit. The rating rule required all 15 Metres to carry a rowing dinghy and typically this was carried over the main skylight. Since this increased windage, Nicholson designed a dinghy with a broad gunwhale rim which countersunk through the deck to form the cockpit. The arrangement was protested at the time, but after satisfactory demonstration including launching under 10 seconds it was accepted. Istria, the most significant 15 Metre ever built, was broken up in Norway in 1924. The 15 Metre class is now substantially revived with the prospect of four yachts racing (Tuiga, Hispania, Mariska and The Lady Anne). G.L. Watson & Co. has traced sufficient archival data from a range of sources to allow an authentic re-build of Istria.